Daily Illuminator: Post-Apocalyptic Peril And Fantasy Fun, With Pyramid! October 1, 2018: Post-Apocalyptic Peril And Fantasy Fun, With Pyramid! The old world is gone, and the future awaits. 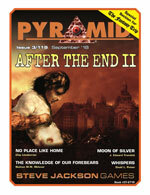 The post-apocalyptic possibilities of GURPS After the End are spotlighted this month in Pyramid #3/119: After the End II. This issue includes a campaign setting where werewolves reign supreme, an adventure where home may be where your heart is, a collection of ready-to-use adventure seeds (complete with GURPS stats), and more. But that's not all! There's also a special section devoted to The Fantasy Trip . . . a celebration after the end of its successful Kickstarter. (See what we did there?) It features new character-creation possibilities, a guide to coins and money on Cidri, and flavorful fiction from TFT Line Editor Guy McLimore. Whether you're in a fantastic realm or a post-apocalyptic wasteland, life just got more interesting with Pyramid #3/119: After the End II. Download it today from Warehouse 23!